Many physicians and therapists agree that herbs and mind-body practices enhance health, but many more are reluctant to integrate them into their clinical work because of a lack of training or, given how long it takes to master the use of hundreds of different herbs, a lack of time. But the trend is clear: clients and consumers alike want control over their health care choices, making the time ripe for a practical resource that guides both the clinician and the consumer on complementary and alternative medicine (CAM). This book answers that call. Three noted experts in integrative medicine, Drs. 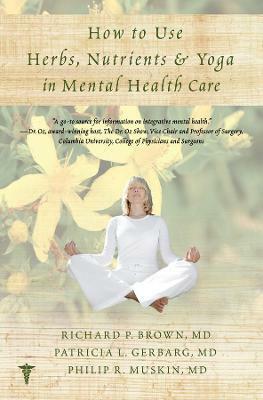 Brown, Gerbarg, and Muskin, demystify the complexities of alternative mental health care, giving readers a comprehensive yet accessible guidebook to the best treatment options out there. From mood, memory, and anxiety disorders to ADD, sexual enhancement issues, psychotic disorders, and substance abuse, every chapter covers a major diagnostic category. The authors then present a range of complementary and alternative treatments-including the use of herbs, nutrients, vitamins, nootropics, hormones, and mind-body practices- that they have found to be beneficial for various conditions within each category. For example, B complex vitamins and folate have been shown to help with depression; omega-3 fatty acids can offer relief for bipolar sufferers; coherent and resonant breathing techniques-used by Buddhist monks-induce healthy alpha rhythms in the brain to relieve anxiety; the elderly can boost their memory by taking the ancient medicinal herb Rhodiola rosea; and those with chronic fatigue syndrome can find comfort in acupuncture and yoga. Focusing on evidence-based approaches, the research, the authors’ clinical experience, and the potential risks and benefits of each treatment are carefully examined. Brown, Gerbarg, and Muskin have distilled an otherwise daunting field of treatment down to its basics: their overriding approach is to present the CAM methods that are most practical in a clinical setting, easy to administer, and low in side effects. With helpful summary tables at the end of each chapter, clinical pearls, and case vignettes interspersed throughout, this is a must-have resource for all clinicians and consumers who want the best that alternative medicine has to offer.